The southeast Asian state of Myanmar (previously Burma) is emerging as an attractive holiday destination, revealing its ancient mysteries and breathtaking beauty to the world. One thing about Myanmar which is not a mystery is its climate: with its southern tip almost nudging the equator, and it’s extremely long shoreline along the coast of the Bay of Bengal and the Andaman sea, it is no surprise to learn that the climate in Myanmar is classically tropical, complete with monsoon seasons. In a nutshell, the weather in Myanmar is hot, humid and wet, all year round, but there are variations in temperature and incidence of rainfall to be had depending on location and season. The positive aspect of monsoon rains is that they tend to fall mainly in the afternoons and evenings, leaving sunny mornings for sightseeing or enjoying the beach. Overall Myanmar’s coastal regions receive in excess of 5,000 mm (196.9 ins) of rain each year. The country is fortunate to have a central “dry zone”, protected by mountains, where the annual average is below 1,000mm (39.4 ins). When it comes to temperature, the average on the coast is 32°C (89.6°F), exacerbated by high humidity, but it is generally cooler in the northern mountains, and the interior around areas like Inle Lake and Bagan. The climate of Myanmar is traditionally divided into three seasons: a hot season, from March to April, the rainy season between May and October, and the “cool” season from November to February. The weeks preceding the monsoon bring steamy heat, particularly along the coast and Delta regions, then the rains set in in May, often bringing floods and overflowing rivers. When the monsoon tails off in November conditions become marginally cooler, sunny and there may even be the relief of cool breezes on occasion. When is the best time to go to Myanmar? Those who enjoy heat will find a holiday in Myanmar enjoyable any time of year. Even during the rainy season (May to October) there is sunshine to be had between showers, and if you plan to visit the central or northern areas, the hot season in March and April can be enjoyable. The recognised main tourist season, however, is between November (when the monsoon ends) and April, when conditions are sunny, dry and hot. This is when most of the country’s renowned festivals take place. Keep the suitcase light, and pack lightweight clothing of material that dries quickly. It is best to bring clothing ideal for trekking and outdoor activity; pack t-shirts and long shorts, at least one change of swimming costume, a light covering like a sarong, as well as long sleeved shirts and hiking trousers. Remember that the Buddhist culture expects modesty, so cover up at monasteries and temples– and don't forget to take your shoes off. Always take a lightweight raincoat and a few extra layers for the cooler months or travel to elevated areas. Carry basic medical supplies and a water bottle with enough fresh water for the day; binoculars are useful for jungle treks. Note: January is peak holiday season in Myanmar mainly because of the favourable weather conditions. Rain is a rarity, with the coastal areas baking in long hours of sunshine, and the hill country to the north experiencing pleasant warm days with chilly nights. In the interior temperatures are high under cloudless skies, but not as high as they will be in the months to come. Note: February is probably the best month for a holiday in Myanmar, with rain being almost non-existent and warm to hot sunny weather pervading the whole country, from the highlands to the coast. The beaches bask in temperatures up to the mid-30s°C (86°F and upwards), while the hill country enjoys sunny days that are appreciably cooler. Book early, because the most popular hotels and resorts fill up quickly. Note: Temperatures and humidity levels begin to creep up, especially on the coast, during the weeks of March in Myanmar, but the country is still a blessed haven for sun-lovers with a negligible amount of rain in the offing. The central plain is dry and hot, and the northern highlands ideal for hiking with an absence of mud and temperatures in the low 30s°C (86°F). 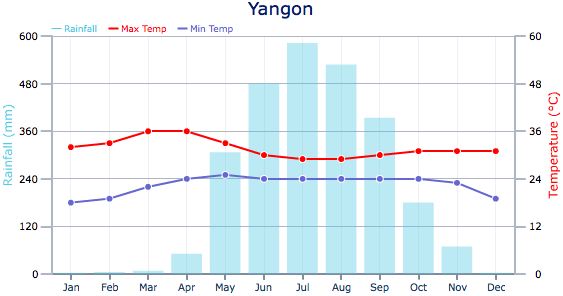 Note: With the monsoon season just a few weeks away, the thermometer is registering highs of up to 40°C (104°F) and beyond along the coast of Myanmar, while even the highlands to the north are scorching with temperature levels only slightly less. This is the last chance for a few months to enjoy the dry heat, as humidity levels begin to rise in advance of the rainy season. Note: A great time for special offers for a holiday in Myanmar, May sees the bulk of the tourists departing, escaping the intense heat and humidity which heralds the arrival of the monsoon season. The incidence of showers increases towards the end of the month, but there are still sunny mornings to be enjoyed and there could be some refreshing cooling breezes. In the central area the mercury hits the high spots, and the rain stays away. Note: The beach resorts begin to close up shop during June as everyone battens down the hatches in preparation for the southwest Monsoon in Myanmar, bringing a slight drop in temperatures, a rise in humidity, and short, sharp rain showers. Note: The rain sets in across most of the country, making holidays in Myanmar not an attractive option in monsoon season, although temperatures remain high. Beach resorts are closed and travel becomes a muddy affair, except in the central area to the south of Mandalay, which remains relatively dry. Note: Rain, rain, rain is the climate picture for Myanmar during August, but the upside is that most of the deluge falls during the afternoons and evenings, and as the month of August goes on, so the amount of rain decreases. The weather in Myanmar remains hot and sticky, the beaches closed and travel a difficult affair. Note: Local Burmese embrace September as the month when the monsoon rains begin to let up with a corresponding fall in humidity and temperature levels. However it still rains most days (especially in the afternoon), and the beach resorts remain closed. Note: October is a shoulder season month for tourism in Myanmar, with the beach resorts slowly reopening for business after the rainy season break. Rain is still prevalent, but temperatures are decreasing slightly, meaning the weather in Myanmar during this period offers some pleasant sunny interludes, ahead of the crowded full season. Note: Almost like a tap turning off, November sees a sudden cessation of the monsoon rains in Myanmar, bringing the tourist infrastructure into top gear. It is a good time to visit beach resorts in Myanmar, ahead of the hordes expected in December. In the highlands temperatures have fallen off markedly and nights can be cold, although days remain sunny and warm. Note: The month of December brings the coolest temperatures in Myanmar, but it is all relative, with average highs of around 30°C (86°F) across the country. The hill country of the north and east are positively chilly at night, but pleasantly warm during the dry days. The monsoon rains are gone and forgotten as the beach resorts hot up and a suntan is guaranteed.